I see nice contrast between the black and white keys with distinct lines and angles formed by the spaces between the keys; to me, it’s an opportunity for a nice black and white photo. To a musician, these keys are the tools to open the door to an infinite number of melodies that make wonderful music. I love to listen to music, but I am not able to make the keys produce a sound that is pleasing to the ear. I am limited in my use of the keys; a photo in black and white. Flash forward to today, this evening just before the sun set, as I was making my way around camp, looking for photo ops, I came across the burnout area. Yep, this is where they line up to burn rubber. John, pictured here saw me with the camera and graciously volunteered to do a burnout for me. Wow, check out all the smoke. Great burnout John. Bummer, I missed a post yesterday! It totally slipped my mind. We attended a meeting and on the way home I made a mental note to get the camera out. When we arr ived at the house, I turned on the MLB All-Star Game, then sat down to watch. After watching a while, I grew tired, then retired to my comfortable bed and was out like a light. I awoke from a deep sleep, panicking, “oh no, I didn’t post a photo!” Oh well… For today’s photo, I wanted to compare an effect from On One’s Perfect Frame 4.6. 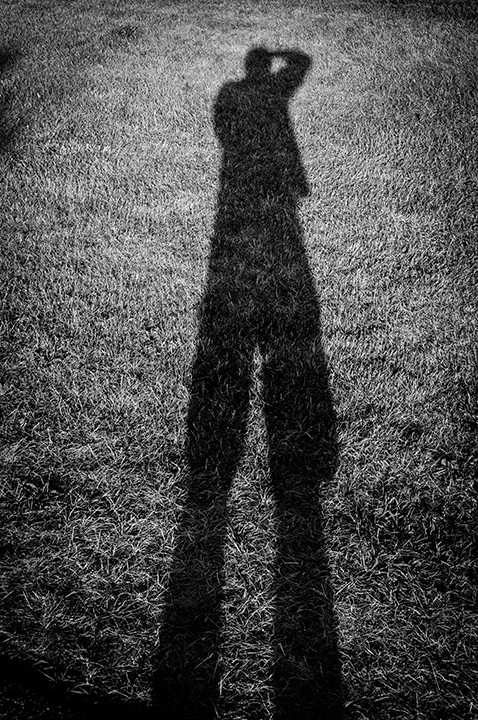 I shot the photo, processed in Lightroom 4 as a black and white photo and then exported to Photoshop CS5. The first picture I added a black outline by extending the canvas. For the second photo, I added an effect called, “Aged Wood” from Perfect Frame 4.6. The dark frame adds a grungy, dramatic, and mysterious feel, by adding to the shadows, it leaves more to the imagination. I feel bad that I missed yesterday’s post, I will try to keep on track the rest of the way! I am attracted to old barns and out buildings. I really like the weathered wood and the old hardware on the doors. The photo to the left is the door and hinges on an old corn crib (that’s what we used to call the one on my uncle’s farm). I like the look of the hinges and the weathered, painted wood. I took this photo and the reset of the photos in this post at the Historical Society of Bridgeport grounds. This is a nice area where the group has put together a nice historic park, including restored buildings from earlier days. There is a paved pathway that you can follow and some really nice flower gardens. I’m not sure what kind of plant this is, but I like the way it is climbing up the beam to the portico. I used my 50 mm lens today. I like the bokeh effect on the back ground, which really draws your attention to the flowers as the main focal point. The picture below was taken in front of the barn. I like the look of the yellow flowers with the barn wood and wagon wheel in the back ground. 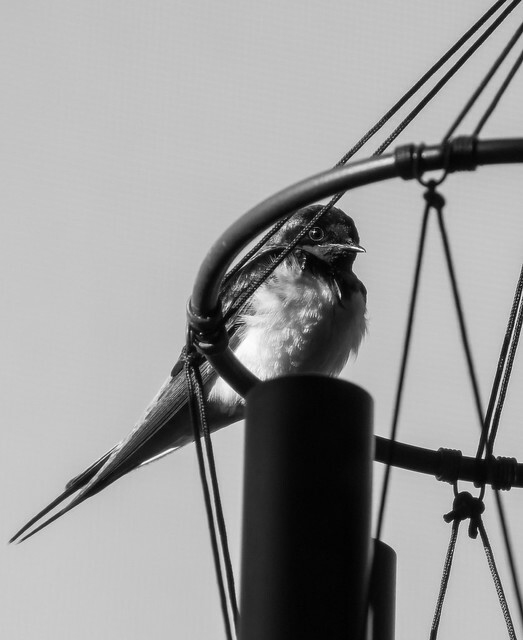 I took this picture of a swallow perched on our wind chime, through the screen window. He looks a little nervous and flew away shortly after I took the photo. I’m kind of on a monochrome kick lately. These weeds are in the field behind my back yard. I wanted to use a shallow depth of field to draw attention to the taller wheaty looking weed, the soft focus on the other weeds provides a nice background. Vicki doesn’t like this photo, because there is too much soft focus, most of the photo is out of focus in her words. What do you think? I have been racking my brain trying to come up with a photo for this week’s challenge, the WordPress Postaday Weekly Challenge. This week’s challenge theme is “Create”. All it took was a quick walk into the back yard. I spotted the this nest the hornets created in my clothes line pole. It appears to be a vacant nest. A spider has built a nest in hope of a return visit from one of the hornets.